Published in Oktopus (Russia,2003), in “Chefs-d’oeuvre/masterpieces by Pascal Lecocq" (Usa, 2011). 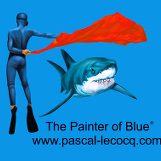 COBALTONE – by Pascal | BLUEPAINTER #pixiv https://www.pixiv.net/member_illust.php?mode=medium&illust_id=73599058 COBALTONE - oil on canvas by Pascal Lecocq, The Painter of Blue ®, 30”x24” , 2015, lec949, priv.coll.Shanghai, China. Featured in the book “Chefs-d’oeuvre/Masterpieces by Pascal Lecocq” (USA, 2011). Inspired by Gil Elvgren’s “Disturbing element” (1939). CIRCUS AQUATICUS - oil on canvas by Pascal Lecocq The Painter of Blue ®, 26“x22" 65 x 54 cm, 1997, lec460, priv.coll.Prevessin, France © pascal lecocq. BLUEPAINTER is a user on pawoo.net. You can follow them or interact with them if you have an account anywhere in the fediverse.